NATS, the UK’s leading provider of air traffic control services, has been awarded the Ministry of Defence’s (MoD) Employer Recognition Scheme (ERS) Silver Award for its strong and continued commitment to supporting the Armed Forces community. The ERS Silver Award is the second highest badge of honour presented to organisations that have pledged their support through the Armed Forces Covenant, and demonstrated a high level of support to the Armed Forces community through their normal business practices. As a Silver award winner NATS has shown that it actively communicates and upholds a positive stance to its employees via established HR policies and practices. This includes access to employment opportunities for armed forces veterans and flexibility towards annual training commitments of reservists. David Barker, NATS Armed Forces champion, said: “We are delighted to have won this prestigious award. The UK is a global pioneer of civil and military partnerships in Air Traffic Management, and NATS is committed to ensuring that this operational partnership strengthens over the coming years. “Your actions mean that our veterans, the wounded injured and sick, our Reservists and their families are not disadvantaged by their military service and have the same opportunities as everyone else. Your commitment is highly valued and is at the heart of all that can be achieved in every part of the country through the Armed Forces Covenant”. 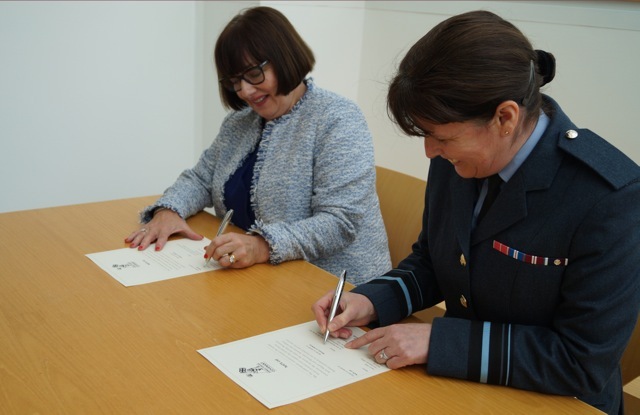 Pictured: Julie Elder, NATS HR and Corporate Services Director, and Air Vice Marshal Chris Elliot signing The Armed Forces Covenant in March 2017.